Oh boy am I excited about today’s post and I think it’s mostly because while the name of these blondies stopped me from making them for so long (brewer’s, like in brewer’s yeast?? ), they actually turned out to use some of my favorite ingredients. 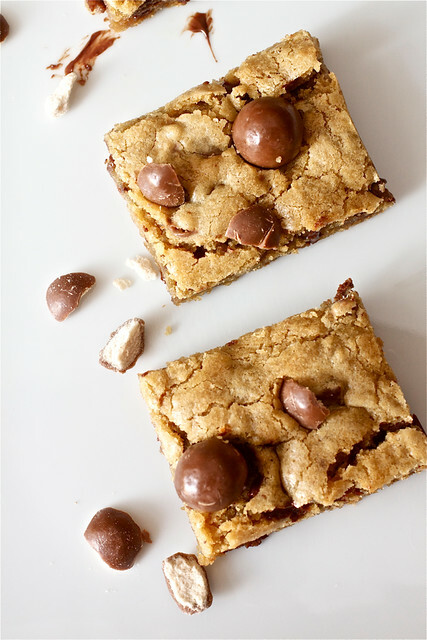 Essentially, we’ve got these fantastic, drop-to-your-knees-amazing malted milk ball/Whoppers blondies from the awesome guys at Baked, who’ve yet to let me down on a recipe. 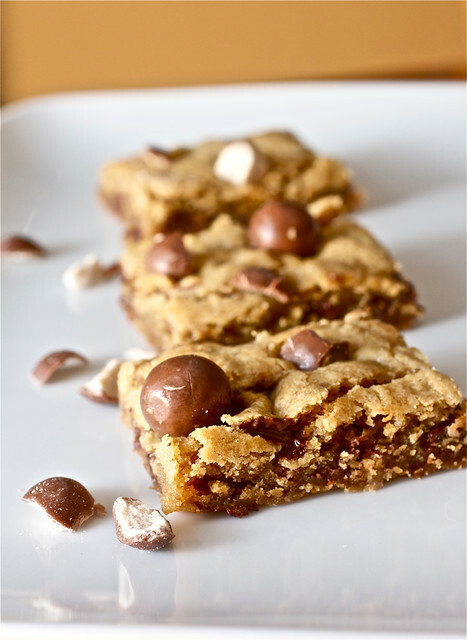 Filled to the brim with Whoppers and chocolate chunks, these blondies are a treat I will not soon forget. If you remember, I’ve been lamenting about my love for malted milk powder over the past year, so you could imagine my excitement when I spotted my new favorite baking ingredient as an ingredient in these blondies. Adding some depth and a little bit of a caramel flavor to the blondies, the powder combines with dark brown sugar, Whoppers, and chocolate chunks…and it’s a heavenly combination. The recipe doesn’t call for it, but save a few of your Whoppers and press them into the tops of the blondies when they come out of the oven, not only for a great look, but because, ummm…it’s whole pieces of candy! Don’t have or can’t find malted milk powder? Well whatdoya know! I’m giving some away!! Preheat oven to 350 F. Grease a 13×9 baking pan with cooking spray or butter. In a medium bowl, whisk the flour, baking powder, salt and malted milk powder together. In the bowl of a stand mixer fitted with the paddle attachment, beat the butter and sugar on medium speed until completely combined. Scrape down the bowl and add the eggs and vanilla, and beat until combined. With the mixer on low, add the flour mixture in two batches and beat until combined. Add in the malted milk balls and chocolate chips and beat until just combined, about 5-10 seconds. The batter will be very thick. Turn the batter out into the prepared pan and with damp fingers, lightly press it evenly into the pan. Bake for 25-30 minutes, or until a toothpick inserted in the center comes out clean. Transfer the pan to a wire rack and let the blondies cool for at least 20 minutes before cutting and serving. The blondies are great warm but the flavor will develop as they cool so they are excellent at room temperature. Once fully cooled, store blondies at room temperature tightly wrapped with plastic wrap for up to 3 days. Malt balls/whoppers are my FAV! YUM! I’ve been wanting to try these since Josie posted about them awhile back, and now I want to even more! They look amazing. Your picture alone has inspired me to pull out that book and have a look at some of the recipes. Not sure why I have not made these ( I have 2 cannisters of malt). Thanks for sharing! These brownies look soooooooooooo good! I’m not really a blondie fan but I can look past that if there are Whoppers involved! Yum! Excited about these … I love Whoppers! Thanks for sharing, and I’m definitely pinning them on Pinterest so I don’t forget to make them! Ah! I’m so glad you posted these! I had them bookmarked from somewhere a longggg time ago then my hard drive crashed and I lost everything (lesson learned on backing up). I have some whoppers left over from Halloween candy and these have been in the back of my mind, but I couldn’t find the recipe and kind of gave up. I am totally making these soon, thanks! I actually buy mine at the homebrew store. Good stuff! Can’t wait to try them. The hubs will be *so* happy! Yes, its official. I would like one of these babies tonight. Don’t you love that cookbook? It is one of my favorites. These looks so delicious! Malted milk balls really make everything better. This is the perfect treat for me. I always have Maltesers listed somewhere in my grocery list…I think I have not outgrown my love for these chocolate malt balls. Really, thanks for this recipe!